Why are we complicating the game of marketing by creating distinctions like social media marketing, content marketing, and shopper marketing? Tactically, things have changed because of technology and consumer cynicism. Fundamentally, though, nothing has changed in the game of endearing a brand/product to a person. 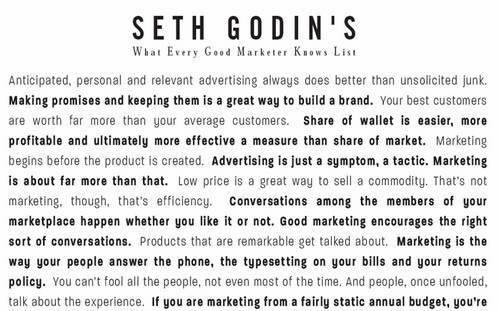 Really good marketing is, was, and will continue to be about getting the right message to the right person at the right time in the right way(s) to deliver the right results. Really good marketing is Ford using social media to create awareness and preference for the Ford Fiesta. Really good marketing is Eloqua sharing relevant information with B2B businesses on how to do business better. Really good marketing is Costco sampling goodies to in-store shoppers to increase sales. No matter the tactics and tools we use, really good marketing is just that ... really good marketing. I'm not someone who buys Cheddar Snaps. Yeah, I like the taste of these baked cheese wafers but they are never on my shopping list. However, I bought a bag of Texas Cheddar Snaps the other day. They weren't on my list but they ended up on my lips. As I was heading to the beer aisle while shopping, an elderly lady stopped me and quietly asked, "Would you like to sample a Cheddar Snap?" Usually I would politely pass. This time I couldn't refuse the offer. She looked like anyone's Grandma and how can anyone turn down Grandma? I couldn't. Before I snapped into a Cheddar Snap, I asked her if she liked them. Grandma replied, "I'd better. They're my recipe." With that, Grandma had me ... I was in. I snapped into the Cheddar Snap. And as I started chewing, she rattled off the wave of flavors my taste buds were experiencing from the type of cheddar cheese to the pecan flavor to the spicy kick at the end. She went on to tell me she's been making these Cheddar Snaps for fifty-plus years. After that, Grandma had sold me ... I bought a bag. We all know sampling can sell a product. What we forget is a customer also needs to sample a story when they sample a product. Grandma sold me some Cheddar Snaps when she told me a story. According to Advertising Research Foundation president Bob Barocci, “The single biggest opportunity in the history of consumer marketing lays dormant.” The opportunity Bob speaks of is LISTENING. And for those you deep into social media you understand the benefits of listening and how listening spurs talking from customers. Before customers spread word of mouth about a business, a business must first open its mouth (and ears) and talk (plus listen) to its customers. Love it. Recently, I had the pleasure of speaking to students in the Master in Innovation and Technological Entrepreneurship department of Tecnológico de Monterrey (Mexico). Students enrolled in this one-year intensive program are given the knowledge, the guidance, and the motivation to start their own business. It’s a very interesting program with ambitious goals that extend beyond creating new businesses to changing the innovation culture in Mexico. In my talk with the students, I shared some “Espresso Shots of Business Wisdom” and passed along some “Tribal Knowledge” from my marketing experiences at both Starbucks Market and Whole Foods Market. Check out the Tec de Monterrey blog for a nice summary. With Foursquare, Gowalla, and other “geo-location apps” becoming the new must-do marketing tool, I hope more businesses follow the lead of an Austin-area Starbucks. A simple handwritten sign acknowledging the loyalty of a frequent customer is all the marketing needed to earn a gleeful shout-out and a simple photo on Twitter. It’s so easy for businesses to turn checking-in with Foursquare and Gowalla into a digital discount program, but is it meaningful? Isn’t it more meaningful, as a customer, to be recognized in a special way from your favorite business than it is to receive a special discount? As a customer loyal enough to become “mayor” of a business, does that customer need a “Buy 9 Get 1 Free” discount to remain loyal? I hope not. If so, then that “loyal” customer isn’t so loyal. A simple acknowledgment, as shown above, can go a long way to fortifying a profitable relationship between a frequent customer and a business. The Purple Cow concept states it’s ultimately more meaningful (and less expensive) to bring a remarkably innovative product to market than it is to spend the advertising money necessary to successfully market a boring product. GreenBox understands the Purple Cow concept. They developed an innovative pizza box that sells itself. This pizza box is not just reusable and recyclable ... it’s also remarkable. The GreenBox breaks down into four serving plates and into a nifty container for leftovers. "Many businesses treat social media tools the same as dropping an FSI or placing a grocery cart ad. It becomes just more superficial window dressing. I think it would be far better to apply that investment toward actually making the brand and products more interesting and remarkable." Now see Tom Fishburne's spot-on illustration. Good stuff Tom, good stuff. His post rekindled some of my thoughts on Creationist WOM vs. Evolutionist WOM (video clip). The Creationist WOM marketing mindset is about making the marketing activity something to talk about as in attention-grabbing stunts and gimmicks. The Evolutionist WOM mindset is about making a company’s products, services, and or experiences worth talking about. Creationist WOM marketers believe Word-of-Mouth just a marketing issue. While, Evolutionist WOM marketers believe Word-of-Mouth is an everyday business issue. We’ve seen Creationist WOM theory at work recently with Denny’s stunt of giving away 2-million Grand Slam breakfasts for free and all the gimmicky commercials shown during the Super Bowl. Specific instances of Evolutionist WOM theory at work are more difficult to notice. That’s because these marketing activities are not supposed to be easily noticed by customers. These activities are simply how a business does business. It’s less about marketing and more about how an interesting business operates everyday. There’s a burger joint in Austin, TX that brilliantly practices Evolutionist WOM thinking — Mighty Fine Hamburgers. No stunts. No gimmicks. No one-off marketing ploys. All Mighty Fine does is earn opinions by serving up remarkable burgers in remarkable ways. Let me count some of these remarkable ways. Total cattle call. I’ve never been to Mighty Fine when the queue wasn’t at least 10 people deep. You go expecting to wait in line. Anticipation heightens the senses. Besides, long lines that move fast mean a restaurant is doing something right, right? If you want Mustard, you gotta say, “Yeller.” “Red” gets you Ketchup and “White” gets you Mayonnaise. Mighty Fine could have gone the common, boring route with Mustard, Ketchup, and Mayonnaise. They didn’t. They decided to make the common uncommon. So uncommon that it’s worth talking about. Ask a Mighty Fine employee behind the counter how they’re doing and you’ll likely hear, “Mighty Fine.” They smile. They laugh. They look like they are having fun. Which all benefits the customer experience. Mighty Fine prides itself on hiring only “A Players” who are positive, supportive, and cooperative. To attract “A Players,” they pay above-average wages and offer much better than expected benefits. Mighty Fine knows by astonishing employees, they in turn, will astonish customers. When placing your order, the Mighty Fine employee writes all your requests directly on the bag. To close the order, the employee again goes over everything with you to best ensure you get exactly the burger you ordered. This process takes time but I’m sure it cuts down on mistakes. As a customer, I appreciate the thoroughness because it brings about assurance. Old-school family-style picnic tables. Nothing fancy. Nothing fancy needed at a burger joint. This family-style seating makes it comfortable for all ages and helps to encourage conversations between customers from different parties. My Dad is a burger aficionado. In his nearly 75 years, Al Moore has cooked and eaten a lot of burgers. He’s burger expert if there could be one. After visiting Mighty Fine in January, he’s been talking about it with his circle of friends. I asked him what he tells people about Mighty Fine and this is what he says, “The place is awesome. Lots of production people, each knowing their job. The product is even more awesome — a top-notch hamburger. To my surprise, the family-style works. I’ll be back.” That’s one helluva endorsement. Instead of a pamphlet by the soda machine to attract new hires, Mighty Fine uses a classic grocery store number dispenser like we used to use at the butcher counter. This dispenser is prominently located in the entry/exit way area for potential new hires to see going in and going out. A sign above the dispenser says, “Apply Now.” You pull the ticket and it directs you to a website to learn more information and to apply online. Again, Mighty Fine is simply making the common uncommon. Nice touch. It’s a “jacuzzi for your hands.” That’s what the hand washer says used at Mighty Fine. It’s the same hand washer employees use, so you know it is more sanitary than the common hand sink washer. Kids clamor to use this hand jacuzzi. Parents are always seen lifting up their kids in order for their hands to fit inside the washer. Of course, parents use it too because it’s just so unique you have to use it. Yet again … another way Mighty Fine takes something common and makes it so uncommon it's worth talking about. Every one of these 11 examples are WOM-worthy. Each one showcases how Mighty Fine turns mundane business matters into something so special that they earn opinions from customers. Because these activities earn opinions, people talk. And because people talk, there is always a line at Mighty Fine. And because there is always a line, Mighty Fine has opened a second location. Mighty Fine doesn’t need gimmicks to get customers talking. It just does business every day in such a way that people gladly talk about it. When you give people something to believe, they will come together. And when people come together ... communities will form, love will spread, and movements will happen. This blog has received lots of links from progressive-minded churches wanting to improve their marketing. It's my turn to reciprocate. Just as churches can learn something from business marketers, business marketers can learn something from churches. Churches do things to turn off potential Christ-followers. And businesses do things to turn off potential customers. ** Kudos to Danny Franks for the heads-up. Kathy Sierra brilliantly (and succinctly) sums up the difference between "Buzz" and "Sustainable" Word-of-Mouth. 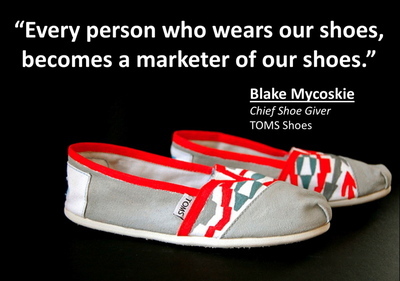 Ben McConnell introduces us (or maybe just me) to the newest poster child business for Word-of-Mouth Marketing ... TOMS Shoes. TOMS Shoes is a Purple Cow business all the way. For every pair of shoes TOMS sells, they donate a pair to children in Argentina and Africa. Amazing story ... learn more by reading Ben's post. Just finished reading Pete Blackshaw's book about "running a business in today's consumer-driven world." Those of you deep into word-of-mouth marketing and social media will already know much of what Pete shares. However, most of your business buddies will learn a lot from Pete's book. (And some of you could use a refresher course on why transparency and credibility matter immensely when citizen marketers are in control.) It's a worthy read. “I would argue that today companies don’t just need to tell good stories; they also need to tell credible ones. Let’s take this a step further. BEFORE any company spends gobs of money on an advertising campaign, it should first spend money on improving the performance of a product/service and on ratcheting up the customer experience. ‘Nuff said! Errrahh! A few weeks ago, I wrote an online essay for Brandweek magazine where I referenced SENDaBALL as having an unconventional business service that requires its customers to think before they purchase. (Sending a ball through the mail, with no box ... just the ball. Huh? Really?) 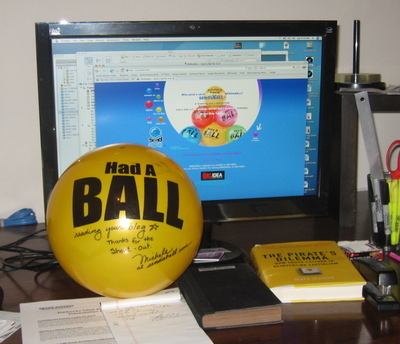 My reference included an embedded link to SENDaBALL.com. The other day a surprise landed in my mailbox — a SENDaBALL. Michele, from SENDaBALL, followed up with an email thanking me after she noticed a bump in traffic to their website from my online essay. Mucho kudos to SENDaBALL. They monitor the blogosphere and acknowledge mentions in only a way SENDaBALL can. What happens next? I blog about it and I also purchase two SENDaBALLs ... one for my niece and one for my nephew. For over a year, Brains on Fire has been helping Fiskars, the scissors company, design a brand ambassador program called the Fiskateers. Last weekend I crashed their Fiskateers Roundup in San Antonio and witnessed the movement firsthand. Ladies sporting orange cowboy hats were all over the hotel and every one of these gals was toting a rolling scrapbook treasure chest of Fiskars goodies. Geno, Spike, Carrie, and Virginia of Brains on Fire worked with Suzanne from Fiskars to put on one helluva weekend full of camaraderie, crafting, and cavorting. In every session, Fiskateers shared their love for how scrapbooking tells the story of their lives. But more than that, these Fiskars evangelists expressed their love and appreciation for how Fiskars products help them tell better stories. It was amazing to hear how much these people ADORE Fiskars. This program has not only profoundly impacted Fiskars, it has also profoundly impacted the marketing agency that designed the Fiskateers brand ambassador program. “I am as much as part of this program as I am trying to shape and support it.” Whoa! That’s a powerful line. And that’s a true partnership between client and agency. Lots of agencies talk about forging partnerships with their clients. Most times that talk rings hallow. Not with Brains on Fire. As evidence by their work with Fiskars, they’ve designed a movement so powerful that it has moved Brains on Fire to become part of the movement. That is, to become genuine Fiskars brand ambassadors. NOTE: The post is meant more for attendees of the In-HOWse Designer Conference (Austin, TX). On Monday, I delivered a presentation titled, Conducting a Marketing Physical To Ensure Brand Health. It's time to give your business a marketing physical. This may sound strange, but it's just like going to your own doctor and getting a physical for yourself. The doc takes your vital signs, asks probing questions, and conducts a few key exams. You learn what may be affecting your health, and then you adjust your day-to-day life based on the results in an effort to ward off serious illnesses. Why not do the same for your brand or business? John Moore shows you how to conduct your marketing physical to diagnose and treat common marketing ailments like anemic sales, poor brand complexion and marketing obesity. RSS Readers ... click here to view the presentation. My friend Jay Ehret is putting on a DIY Small Business Marketing Seminar in Killeen, TX on Wednesday, August 15. He’s planning to give attendees all the know-how/how-to in developing and implementing effective marketing plans. If you live in and around the badlands of Central Texas, I suggest you consider attending. Oh yeah, I’m closing the seminar with my BIGNESS OF SMALLNESS presentation. Learn more here and here. Sign-up here. The Wine That Loves website is now online. 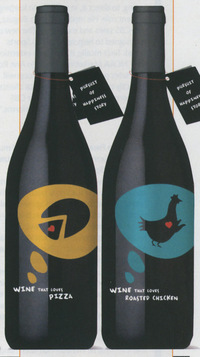 And, BusinessWeek (SmallBiz edition) has an interesting piece on Wine That Loves. For many of us, it’s intimidating to buy wine. Why? Come on, we know the reasons why. Most labels are obtuse. Styles are ill-defined. Pairing wine with food is utter guesswork. And prices can get super-spendy. It takes an educated person to understand the information on wine labels from the appellation of origin to the grape varietal to its quality designation. Most of us cannot begin to articulate the differences between a Cabernet Sauvignon, Merlot, Sirah, Pinot Noir, or Zinfindel. Pairing wine with food beyond knowing that white goes with fish and red goes with steak is a mystery for many. And most of us shudder to think of spending $60+ on a bottle of wine we’ve never heard of at a restaurant. That’s the problem and the Amazing Food Wine Co. thinks they have the answer—easy to understand wine labels. According to BrandWeek, the Amazing Food Wine Co. is launching a new wine brand called, Wine That Loves. This new wine brand “…takes the guesswork out of pairing wine with food. Thus, Wine That Loves Pizza, Wine That Loves Pasta, Wine That Loves Roasted Chicken, and so on." Wine geeks do not like these labels because details like grape varietal, vintage year, and growing region are not included and those details matter greatly to wine geeks. But this wine isn’t being made for wine geeks. It’s for all those folks who are either intimidated by selecting wines or unable to decipher the language intricacies of wine labels. And ya know what, there are more wine neophytes than there are wine geeks. While these wine labels take a whimsical approach to communicating wine and refuse to get caught up in granular grape details, it's not like they are absent of information. On the back-side of each bottle is information which will help wine newbies gain a basic tasting vocabulary (tannins, acidity levels, etc.) from which to better describe the wine they are drinking. So maybe, just maybe, after being introduced to wine with the “Wines That Loves” labels, these wine neophytes will begin their journey to understanding/appreciating wine and ultimately graduate to wine geek status. Now, let’s hope the Amazing Food Wine Co. took as much time crafting the wine inside the bottle as they did in crafting the label on the outside of the bottle. Last week Jena McGregor (BusinessWeek reporter) and I chatted about “authentic marketing.” This was in conjunction with the article BusinessWeek ran in its Sept. 18th issue detailing the recent marketing makeover at Safeway. You can access the audio of our conversation here but you might wanna familiarize yourself beforehand with the BusinessWeek story we reference in our chat. The same-store sales pendulum at Safeway has swung from a negative 4.5% 2003 to a positive 4.3% in 2005. Safeway insiders are crediting its major renovation efforts as the reason for the dramatic change in sales. Beginning in 2003, Safeway committed to spending billions of dollars to remodel all 1,775 of its stores. The remodeling efforts were more than just cosmetic as Safeway made a concerted effort to improve the quality of the food it stocks, as well as the quality of the experience it delivers to customers. Perishables have been upgraded to include more organic offerings and exotic choices. Beef and poultry have been upgraded and the floral department has also undergone a significant quality upgrade. Additionally, Safeway enlisted the assistance of Orangetwice to remodel its stores to exude a much more authentic look and feel. Safeway wisely waited until its stores were remodeled and its merchandise was upgraded before it began running its “Ingredients for Life” advertising campaign. In our conversation, Jena and I touch upon the importance of going inside/out when brands undergo the renovation process. We also discuss how Whole Foods Market and Starbucks Coffee have it seemingly easier when it comes to “authentic marketing.” Plus, I share my thoughts on a few steps traditional mainstream brands can take to tell a more authentic story. Jena McGregor & John Moore chatting about Safeway, Whole Foods, Starbucks, and "authentic marketing." While visiting with the Brains on Fire crew, they shared with me some work they're doing with Fiskars. I’ve only known Fiskars as a maker of scissors. But Fiskars is much more than a scissor maker. They are deep into the whole scrapbooking thing. Anyway … Brains on Fire has helped Fiskars to identify some of its customer evangelists and in turn, crafted a Fiskars Brand Ambassador program cutely named, “Fiskateers.” Not only can other Fiskars evangelists become Fiskateers, they can also participate in a Fiskateers blog. On the just-launched blog, four Fiskateers are actively blogging and sharing their love for all things scrapbooking. Recent posts include Father’s Day book ideas and “get-well” love from Fiskars Sisters. This Fiskateers Brand Ambassador program is a customer evangelism case study-in-the-making. Nice work Brains! And kudos to Fiskars for embracing customer evangelism. Meaningful marketing is about delivering impactful strategic multi-dimensional, best-in-class customer-focused marketing initiatives to deliver against the holistic mission of the enterprise all the while synergistically aligning with the brand’s signature DNA. It’s about capitalizing, in full totality, on consumers as being stakeholders in the monetization of the enterprise. It’s about expertly exploiting consumer mindshare opportunities; it’s about empowering consumers with value-add proprietary propositions; and it’s about maximizing results-driven customer relationship management infrastructure to elicit a seamless sustainable revenue competitive advantage. For conversation purposes [Doh! … “conversation” is a Marketing 2.0 jargon-ish word -- sorry Tom] … below is my original definition for meaningful marketing which Tom Dixon called me out for. Meaningful marketing is about designing marketing activities to deliver on the vision of the business all the while being smart, savvy, and authentic. 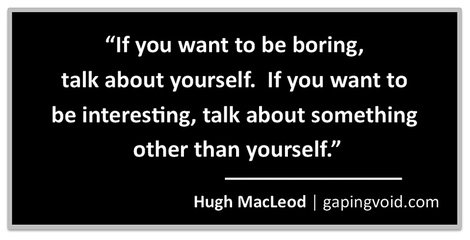 It’s about treating consumers as being everyday explorers who seek to be interesting and interested. It’s about building preference more than awareness; going beyond capturing attention to soliciting intention; and it’s about fostering loyalty beyond reason from customers. It’s astonishing—the ability of Blogs to infect me with ever-evolving ideas. For example … the other day I read Hugh riffing off a line he picked up from Doc Searls. Dang Doc, that is chewy. Now I get to mash-up that tasty marketing morsel with other idea ingredients to help better bake my take on meaningful marketing. 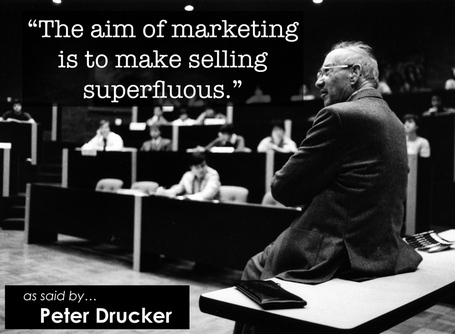 The Most Important Word in Marketing? Scott … that guy with the nametag … has started an interesting conversation about what the most important word is in marketing. I say AUTHENTICITY. Seth says RESPECT. What say you? Share your word on Scott’s blog. Seth blogged it. Aaron designed it. On Saturday afternoon at SXSW, Scion, the upstart youthful skewing car brand from Toyota, pulled off a co-created brand hijack by staging a semi-exclusive free music showcase for daKAH, a 70 member strong hip-hop orchestra. Alex Wipperfurth, author of Brand Hijack, defines the co-created hijack as, “… the act of inviting subcultures to co-create a brand’s ideology, use, persona, and pave the road for adoption by the mainstream.” And yesterday, Scion seeded itself amongst an early adopter market of 750+ influential and leading edge musical provocateurs by providing them an experience they otherwise would not have experienced. Double G daKONDUCTOR is right … no record company in its right mind would fly out 70 musicians for a 90-minute showcase. But daKAH is a band worthy of notice and it wouldn’t surprise me if daKAH becomes the next Polyphonic Spree. After all … it was SXSW 2002 where Polyphonic Spree was discovered by influential, leading edge musical provocateurs at a music showcase. The question is … has Scion bet right and will daKAH blow-up like Polyphonic Spree did? And if daKAH does blow-up (as I think they will), how tightly associated will Scion be with music’s newest 'it' band? Have too many of us marketers become label managers and not brand managers? Hmm ... that’s a great question to ask ourselves.